It may be too soon to define the legacy of Kofi Annan, who died August 18 at age 80. But the former secretary-general, who presided over the United Nations from 1997 to 2006, is being remembered as a warm, soft-spoken person who listened closely to those around him and led with an assured confidence. “Kofi Annan was one of the highest profile and most widely admired secretaries-general to lead the United Nations,” said Dr. Edward C. Luck, a professor at Columbia University’s School of International and Public Affairs who was assistant secretary-general and special adviser to Secretary-General Ban Ki-moon from 2008 to 2012. Annan, who was born and raised in Ghana and educated in the United States and Switzerland, was the first secretary-general who rose through the ranks of the United Nations to become its leader. Over the years, he worked for UN agencies including the World Health Organization, the UN High Commissioner for Refugees, and the Department of Peacekeeping Operations (DPKO). 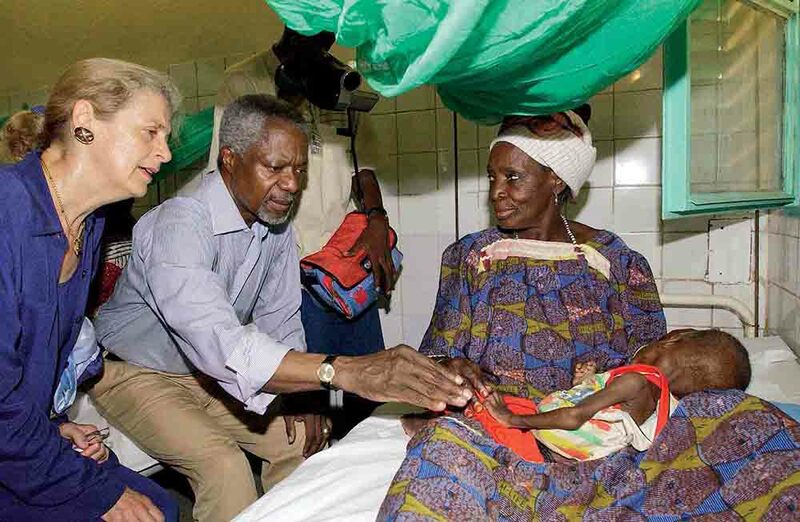 “He was a pivotal figure at UN headquarters” long before he was secretary-general, said Barbara Crossette of The Nation, who, as UN bureau chief of The New York Times, began covering Annan when he was head of the DPKO. 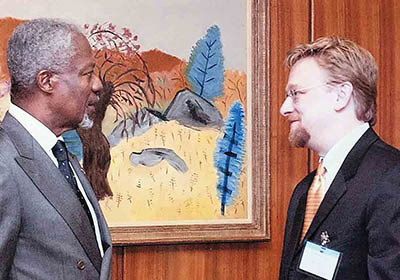 Dr. Robert Orr, dean of the School of Public Policy at the University of Maryland and a former assistant UN secretary-general, also got to know Annan at the DPKO. Orr was working for the US government at the time. When Annan was elected secretary-general, Orr was working on UN affairs at the US National Security Council and took a lead on US policy toward UN reform. 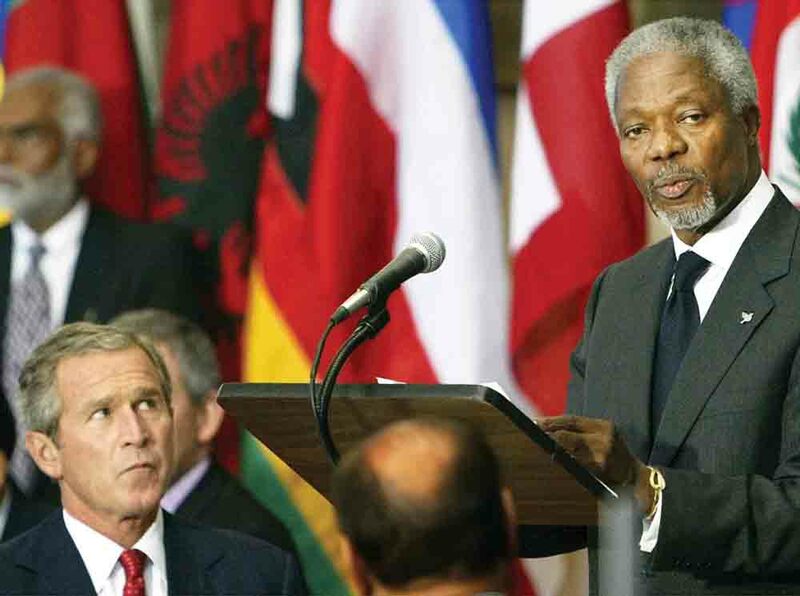 Stanley Foundation President Keith Porter, who first met Annan in 2005 when he interviewed him for a radio documentary, said that year’s World Summit is perhaps the closest the United Nations ever came to large-scale reform. “That effort was mostly derailed by a handful of member states. But that shouldn’t diminish some of the things that did come out of the 2005 World Summit.” Porter said one of the most important things to come out of that summit was the adoption of the Responsibility to Protect (R2P). “Kofi Annan took that very seriously. It should be remembered as a highlight of his term,” Porter said. Another initiative Annan launched was the Global Compact, which encourages businesses to adopt sustainable, socially just policies. “In launching the Global Compact, he signaled his intention to bridge the long-held aversion to the private sector that was pervasive in the world body,” Luck said. “Likewise, he constantly stressed the importance of civil society in the UN’s work across the board. Both of these steps have laid the foundation for a much broader and more inclusive approach to conflict prevention, peacemaking, and peacebuilding,” Luck said. 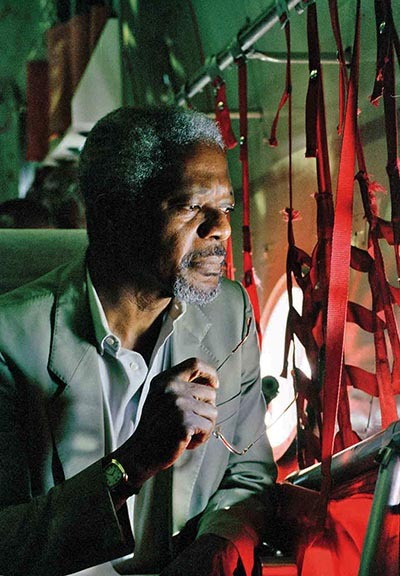 After September 11, Luck said, Annan moved quickly to formulate a counterterrorism strategy for the United Nations. “He was a believer in the value of ideas and of upgrading UN doctrine to advance peace and curb conflict,” Luck said. 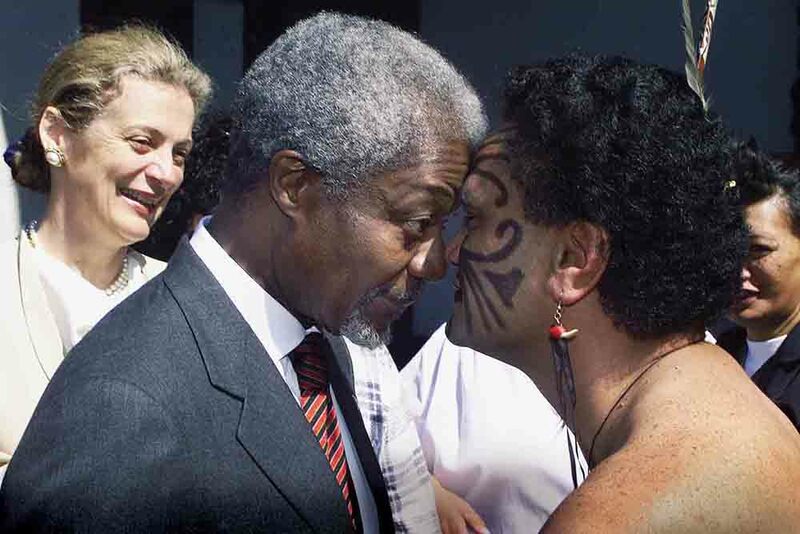 Annan’s leadership of the United Nations wasn’t without its bumps. “When I think back on his term as secretary-general, there were historic challenges, events that he had to react to and for which the moral leadership of the office came into question,” Porter said. Crossette said Annan was also criticized for what became known as the Oil for Food Program in Iraq. Under the arrangement, Saddam Hussein’s government, which was subject to tough UN sanctions after the invasion of Kuwait, was able to sell its oil to buy certain goods only for (ostensibly) humanitarian purposes. “When it turned out to be a scandalous operation, with countries and companies cheating by cutting illegal secret deals with Iraq, Annan was severely criticized by Republicans in Congress and a lot of American media,” Crossette said. But an investigation by former Federal Reserve Chairman Paul Volcker in 2005 cleared the United Nations of any wrongdoing. 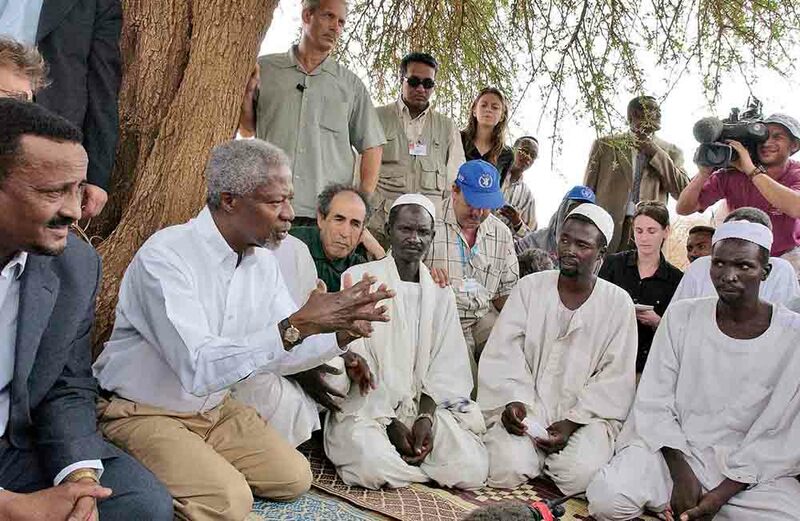 Although he came to lead the United Nations thanks mainly to the United States, Annan did not have the easiest time with the Americans during his tenure, especially when it came to Iraq. “Personally, Annan’s health suffered severely under the tension and some vicious opprobrium heaped on him in the US, almost to the point of a nervous breakdown,” Crossette said. In 2003, Annan said the US-led invasion of Iraq that overthrew Saddam Hussein was counter to international law, causing outrage in Washington, according to Crossette. Annan was roundly and unfairly criticized by some American experts and members of the press, according to Porter. “It seems particularly unfair, because he understood that it was a great failing of the institution that it couldn’t stop that war from happening,” Porter said. “When he was accused of failing, it was often because prominent Security Council members, usually the United States, blocked his moves,” she said. Such moves weren’t exclusive to Annan, either. Annan was “an extremely sensitive and warm person who only occasionally showed flashes of anger,” Crossette said. She recalled a time “he was under intense pressure, and he dressed down a British reporter who, in his words, was behaving ‘like a schoolboy’ by badgering him during a briefing,” Crossette said. Orr said Annan’s background in Africa helped ground him. His demeanor cannot be separated entirely from his partnership with his wife, Nane, an elegant Swedish aristocrat and international lawyer in her own right. They were a very close pair who were much sought after by many leaders of various sectors in New York life, as well as by all the diplomatic missions surrounding the UN. They were gracious and outgoing together, but could communicate in an almost imperceptible exchange of glances. Nane, who was also a talented artist, had her own life but often used it to supplement his work, hosting lunches for prominent women or other important people passing through the UN. as UN bureau chief for The New York Times.